For the last 19 years, backpacking has become a passion. I am a four-season backpacker and an off-trail navigator. Although I do take yearly trips to the American West or Southwest, the majority of my trips are in Michigan and Canada. My pack weight varies considerably but my base weight is below 18 lb (8 kg). I am primarily a tarp camper who averages more than 50 nights a year backpacking in a huge variety of weather conditions including relentless rain, wet snow and sub-zero temps. The SmartWool Sport NTS Tee Shirt arrived in great condition. Although I was expecting the long-sleeve version, a short-sleeve version arrived instead. The tee shirt that I received is in the color of black and the size of Women's XL (extra large). I normally wear a size large in most products but requested the XL based on other SmartWool apparel that I own. I am happy with the fit as it's not too snug but still fits close to the body. When I looked at the tee for the first time I noticed how long and narrow the top looked. After trying it on my body, I noticed that the finely ribbed top lay nicely over my body without puckering. The merino wool feels soft against my skin and not scratchy. I also noticed that the fabric feels heavier than what I expected. According to data on the website the weight is 220 gm/m2 which I assume is 220 grams per square meter. The length of the tee shirt is awesome as it will be cold here very soon. It will make keeping a shirt tucked into pants much more likely to stay. I have a somewhat long torso anyway so it is quite nice to have a tee shirt that is not too short! The side seams of the shirt measure more than 18.5 in (47 cm) in length. 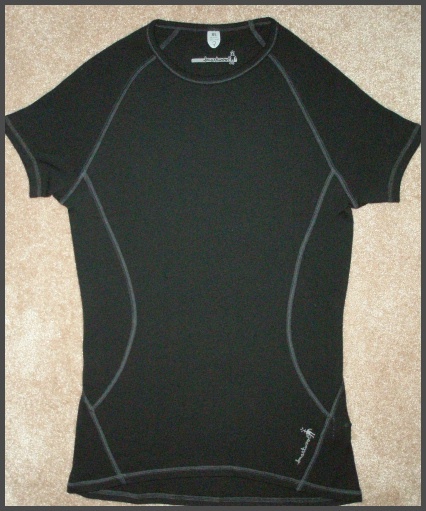 SmartWool markets this tee shirt to be used as a base layer (NTS= Next-to-Skin) or just by itself as a top. I envision using it as a top for the first part of the test but mostly as a base layer for the winter season. The tee-shirt is made out of 100 percent merino wool. According to SmartWool, the "SmartWool" designation refers to their production process that takes the itch and shrink out the merino wool. The material is reportedly a great temperature regulator. The manufacturer states: "This is because each fiber harbors thousands of tiny air pockets which, like insulation in your house, act as a buffer against heat and cold. The fibers naturally regulate temperature, whether you’re climbing an 8,000-meter peak or running a marathon in the desert. They keep you warm when it’s cool and cool when it’s hot, while moving moisture faster than any other material on the planet. This means you stay drier longer". Even though the tee shirt is a basic product, SmartWool's design team has added a bit of pizzazz to it by using contrast color stitching in the flat lock seams (charcoal gray is used on the black version). These princess-type seams form a feminine or contoured shape to the garment on both the front and back of the shirt. The tee-shirt has a crew neckline and short sleeves. The sleeves have raglan-style seams and possess short underarm seams measuring approximately 2.75 in (7 cm). 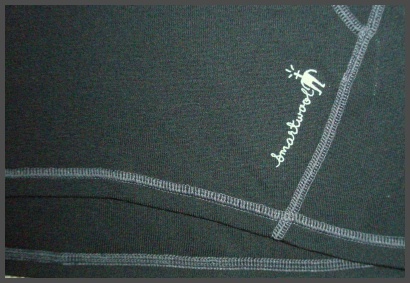 The bottom corner of the shirt features a SmartWool symbol next to one of the contoured seams. According to the manufacturer, SmartWool has odor control and is naturally antimicrobial. The Sport NTS Tee is easy to care for on an everyday basis. The tee shirt can be washed in a machine with cold water on a gentle cycle. It can be tumble dried on low and non chlorine bleach can be used if necessary. It can also be ironed or dry cleaned but I don't imagine that I would ever do that! I'm looking forward to wearing the SmartWool Sport NTS Tee for the next four months of adventures. I will wear it not only for backpacking but trail running, mountain biking, snowshoeing and cross country skiing. During the field test period, I have worn the SmartWool NTS Tee Shirt during four backpacking excursions for a total of thirteen trail days. I have also worn it extensively for other sport activities several times a week. Locations ranged from and included boreal and deciduous forest communities, backcountry lakes, islands and more. Elevation ranged from 600 ft (183 m) to approximately 1400 ft (427 m). During the first two backpacking trips I was able to wear the SmartWool NTS Tee Shirt at least part of the time as a single layer as the weather was warm. I would start and end the day with the crew mostly layered with a very light wool long sleeve top over it. I would then remove the extra layer for the majority of the day. The high temps experienced during those initial trips were in the mid-70's F (25 C). I definitely became sweaty but that was more attributed to the color of the shirt - black! The NTS Tee still performed well as I didn't feel overly clammy. During my third trip the weather was much colder/wet and the NTS Tee was the base layer next to my skin with various other layers in place during the entire trip. 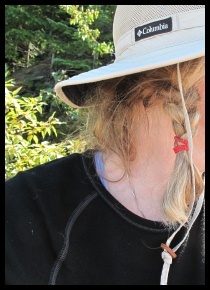 These often included a long-sleeve wool top and a thermal Patagonia R1 Hoody during hiking hours. A rain jacket was worn almost full time due to the wet conditions. At no time did I feel uncomfortably hot or sticky. During my fourth backpacking trip the weather was cold and windy. The SmartWool Tee was layered with a long and thin layer of wool, an RI Hoody and shell jacket (the NTS Tee is slightly visible under my other layers in the large picture below). Again, I found the NTS Tee to layer very nicely. Its close-fitted design has allowed me to layer without bunching or wrinkles. The NTS Tee is so soft against my skin. The wool has never felt itchy and it keeps my body comfortable at all times. Besides being comfortable and breathable my favorite attribute has been the length of the shirt. I never have to tug on it to keep it in place as it stays so nicely where it belongs. I have also worn it on every trip as my base layer for sleeping with two thin wool long sleeve shirts over it. Unlike the top two layers which were shorter in length, the length of the NTS Tee kept it from riding up and exposing my backside. I also like the length of the sleeves and the way they gently hug my arms. They do not push up when I layer over them. The tee hasn't been noticeably smelly after wearing it multi-days on the trail without washing (all trips were either 3 or 4 days in length). Besides backpacking, I have worn the NTS Tee for trail running, mountain biking and more. Those activities required a light shell jacket over the crew due to the cold weather. Recently I have taken a series of spin classes (bicycle) inside at the local YMCA. I thought I would try wearing the SmartWool Tee for these intense classes. I was almost certain that the weight of the shirt might be too heavy but it has turned out to be the perfect shirt for these rides. Not only does it breathe well but it manages the moisture well while cycling so that the shirt is not dripping wet. In fact it feels amazing after class in contrast to my sports top underneath and my cycling shorts. Who would of thought? I also like the fact that the shirt doesn't ride up during class as we change position often from standing to sitting. I have already worn it for eight classes and it works so well that I will continue to wear it for more. I have washed the NTS Tee so many times I have lost count. It is in the laundry at least a few times a week (over 20 times for sure). I machine wash it with other dark clothing and then dry it for a few minutes and then hang to dry with similar items. It is always completely dry for the next day's activities. It hasn't shrunk and although the shirt might not look like new I haven't really noticed that it faded much. During the long term period, I wore the NTS Crew for one backpacking trip of two days, a snowshoe-in rustic cabin trip of four days (skiing and snowshoeing) and for approximately 16 other cross country ski days (total of all activities approximately 22 days). Locations ranged from and included boreal and deciduous forest communities, backcountry lakes, lakeshore, both maintained and unmaintained ski trails and more. Elevation ranged from 600 ft (183 m) to approximately 1400 ft (427 m). During the long term period, the SmartWool NTS Tee has been worn mostly outdoors for a variety of winter activities. During my early December backpacking trip, I wore it under a light thermal shirt that was topped by a stretch shell jacket. The weather was windy, cloudy and cold with a high of 25 F (-4 C). When I got to camp I put on more layers including a light down jacket. I was completely comfortable at all times even though I kept a good pace. At night I comfortably slept in the NTS Tee layered with the light thermal shirt inside my sleeping bag. During my snowshoe-in rustic cabin trip I wore the NTS Tee layered with a light wool top and a shell jacket. 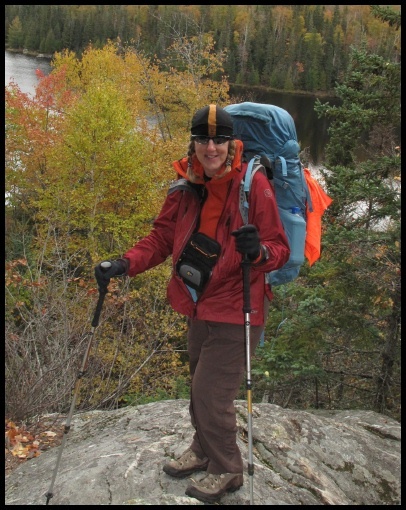 Depending on my activity during the four days, I often layered other clothing with it (for backcountry skiing and snowshoeing ) and when the cabin was too toasty or I was cooking food on the wood stove fire I often stripped down to just the tee as a base layer. During numerous cross country ski outings I often wore the NTS Tee with a light-weight long sleeve wool shirt over it and then topped with a light stretch shell. The NTS Tee layers so nicely as it fits close but it doesn't cling. When other layers are added I don't end up with a lot of bulk like sometimes happens with other clothing. The NTS Tee has continued to be one of my favorite shirts not only because it is comfortable and nice fitting but because the length of the shirt has kept me from repeatedly having to tuck my shirt in. I just love the long length especially when I bend over to fasten or unfasten my ski bindings. With most clothing that usually means my shirt would come out and I would have to re-tuck it in place. This simply doesn't happen with the NTS Tee and I don't feel any cold on my backside. I might note here that when I sleep in the shirt during backpacking trips it has the same benefit as I don't have a chilled back from my shirt sliding upwards. The NTS Tee has proven to be not only highly breathable during light aerobic activity (such as backpacking) but also performs well for strenuous aerobic activity (such as cross country skate skiing). The temperatures I have worn the tee have varied in the long term period but the highs were never more than 25 F (-4 C) and the lows were near zero (0 F/-18 C). The merino wool has remained very soft and non itchy against my skin. The seams on the shirt have not been irritating in any way. I have continued to wash the NTS Tee several times a week and it remains visibly attractive. If it has lost any color I can't really tell. It has not shrunk and its durability is not in question. I feel that it will last a very long time due to its performance during the last four months of much activity. In conclusion, I remain surprised how much I enjoy wearing the SmartWool NTS Tee. I had thought that I wouldn't get much wear out of it due to the cold weather here, but it has layered nicely and I really enjoy the length of the shirt. I have never felt uncomfortable wearing the shirt and I often forgot that I even had it on underneath all the other layers. I will continue to wear the NTS Tee for a long time and will likely buy a lighter color version of it for the summer months! Thanks to SmartWool and BackpackGearTest for this opportunity to test the Sport NTS Tee Shirt. This concludes my Long Term Report and the test series.